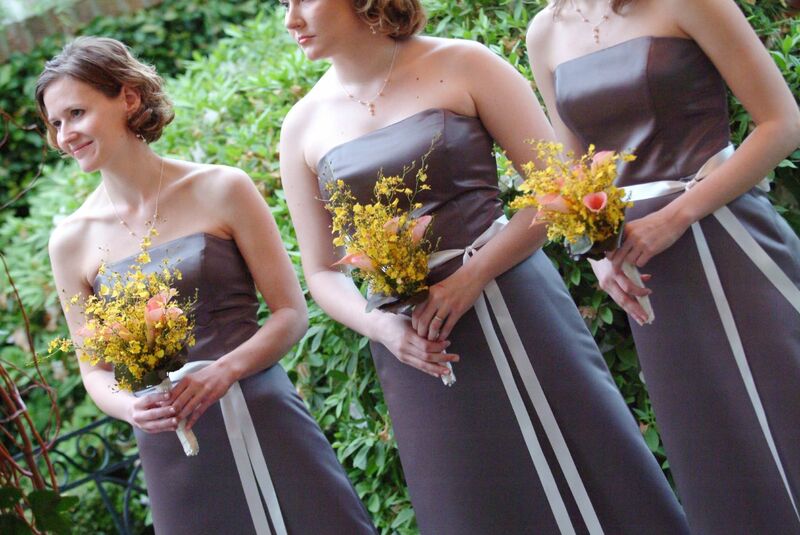 When you get married, your bridesmaids are an important part of your special day. These handpicked women are family and friends who are important in your life. The women have helped you with wedding plans, thrown showers or parties for you, and they will be there for your big moment. They are there to support you, wish you happiness, and stand up with you. 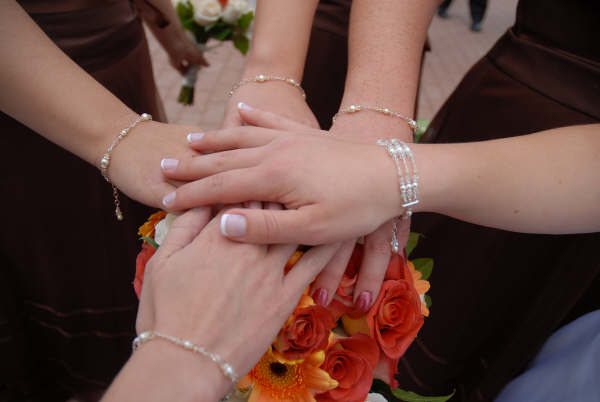 Many brides give their attendants a gift of jewelry as a thank you for being part of their special day. You can choose from several beautiful ideas for bridesmaid jewelry for your attendants. Many online stores including DHgate, eBay, Etsy, and American Bridal carry a wide selection of stunning choices. Hair combs with jeweled accents are elegant and will look dazzling in your bridesmaid’s hair. This comb has small sparkling crystals in a floral pattern that adds a glamorous final addition to the hair. It is an accessory that can be worn time and time again for other occasions when a hint of glamour is called for. 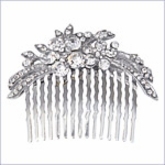 This jeweled comb is available at American Bridal. Another beautiful gift idea for bridesmaids is jeweled hair pins. These hair sticks can be worn in hair of any length to add an elegant touch. 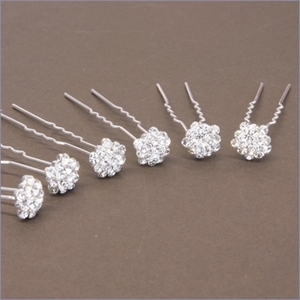 The rhinestone hair sticks add sparkle and shine to hairstyles for your special day. American Bridal carries these stunning pins as well as other designs. Etsy also has a selection of hair pins. Add a vintage look to your bridesmaid dresses with a gift of a beautiful brooch. 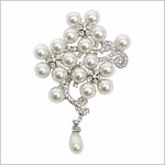 A brooch with faux pearls and rhinestones is an ideal accent for a bridesmaid gown. The brooch will sparkle against any gown for an elegant look. This decorative pin is available at American Bridal. A dainty rosegold ankle bracelet is another idea as a gift for your attendants. The chain is sterling silver with a delicate heart charm adorning the chain. The charm is rosegold plated on this handmade item. You can find this ankle bracelet along with a wide selection of other designs on Etsy. A unique idea for jewelry for your bridesmaids is a delicate gold bangle bracelet with the words, faith, hope, and love engraved on the yellow gold plating. The bracelet is a charming accessory with scrolls in between each word adorning both sides of the two-sided bracelet. This beautiful piece of jewelry is found on eBay. A sparkling pair of chandelier earrings adds a hint of romance for your attendants. Sterling silver will sparkle from the ears with every turn of the head. The beaded earrings are 3-inches in length and hang gracefully from each lobe. 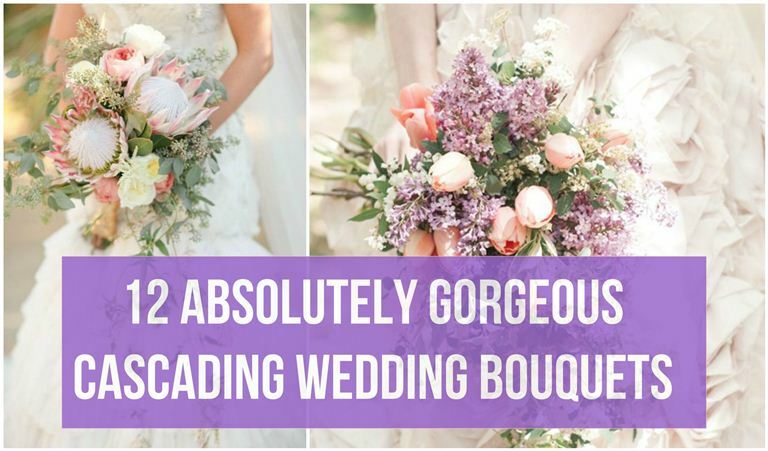 They are available on eBay and make a stunning gift for bridesmaids. Dangle pearl earrings are another idea for accessory for your attendants. The faux white pearls hang inside a silver teardrop for an elegant look. They are an ideal accessory your wedding party will be able to wear for many other occasions. These sparkly earrings are available on Overstock Jeweler. Several types of necklaces make stunning accessories for your wedding party. A simple yet elegant sterling silver necklace on a delicate chain with an infinity knot in the center is ideal for weddings. It adds simple adornment without taking away from the beauty of the dress. 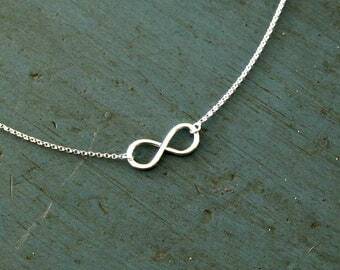 This infinity necklace is available on Etsy. Personalized gifts are a nice idea for your wedding attendants. A romance pearl personalized bracelet adds glamour to a look. The delicate bracelet has a round silver charm engraved with an initial. 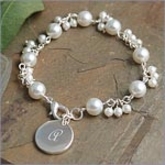 This personalized bracelet is available at American Bridal. A jewelry set makes a very nice gift for the women in your wedding party. 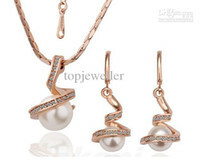 This set of pearl earrings and necklace with a gold chain and small stones is an excellent choice. The elegant design has a unique look with the pearls circled by the gold. The set is available at DHgate as well as a wide selection of other designs.